Located in southwestern Pennsylvania at the confluence of three rivers: the Allegheny, the Monongahela and the Ohio. Known as the Steel City, Pittsburgh emerged in the late 1800s as a world center for coal and steel. Despite setbacks to the steel industry and a population decline over the last few decades, Pittsburgh remains the state's second-largest city and an important industrial center. 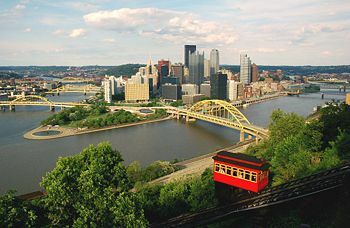 Pittsburgh has just been named one of America�s comeback cities by Forbes Magazine in 2012 with growth in population, very low unemployment and a growing job market. Today, Pittsburgh is a city of 330,000, and a metropolitan area over 2.3 million people with a diversified economy that embraces high tech, education, health care and financial services companies throughout the city. There are a great variety of nightlife attractions in the Steel City. There is the "24-hour neighborhood," Strip District is a one-half square mile area northeast of downtown that's loaded with shops, restaurants, bars and clubs. For a quieter scene, Pittsburgh's South Side has the city's best restaurants, historic Victorian architecture, and shopping and entertainment options, as well as more bars/clubs per capita than anywhere else in the US. Downtown is �new� place to be with more residential population, bars and ultra-lounges are popping up throughout the Cultural District. If you're interested in Pittsburgh, please email your resum� with an introductory letter to to Dayna Lynn at dlynn@fsgltd.com or fill out the form below.